Visitor TV creates engaging video advertising for San Luis Obispo County businesses that play alongside our award-winning tourism focused content. Visitor TV creates engaging video advertising for Central Coast businesses that play alongside our award-winning tourism focused content. 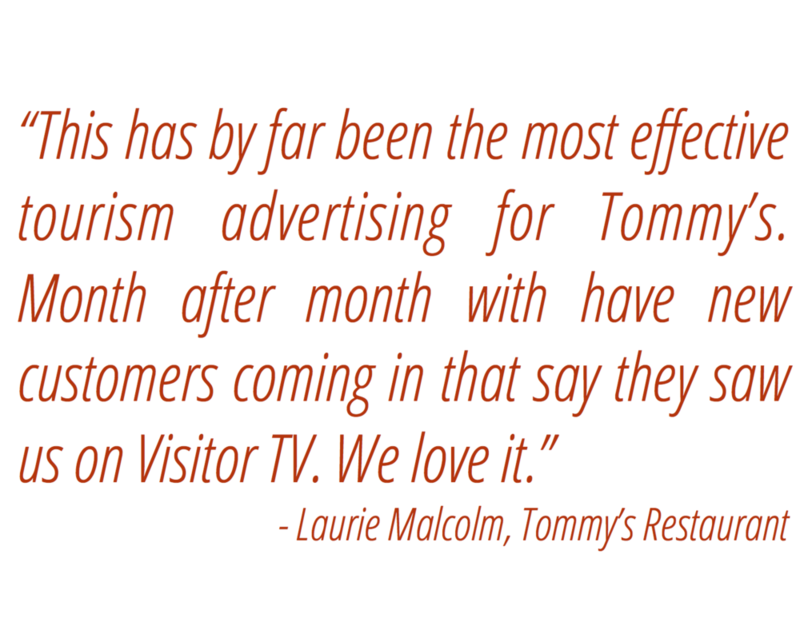 Airing in prominent San Luis Obispo County hotels and at the SLO County Regional Airport, Visitor TV is seen by ten's of thousands of tourists every month. Join us, and let the adventure begin. You'll be amazed at all the incredible experiences awaiting you on your next vacation in California. From our award-winning creative team comes original, beautifully produced programming about the best of local entertainment and adventures immediately surrounding your travel destination. From hiking to history, surfing to snow shoeing, you'll be inspired to create the memories that last a lifetime. As the exclusive tourism adventure channel in over 75% of hotels in the markets we serve including the SLO Airport, we're entertaining millions of travelers every year. 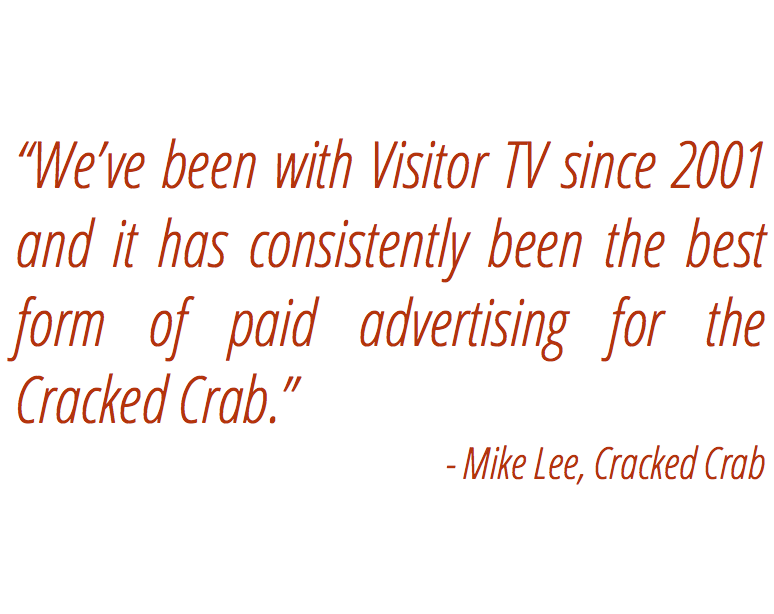 Since 1997, Visitor TV has been entertaining and informing travelers about the best of local adventures and businesses that make a destination unique. Today, we're proud to be able to share all the amazing adventures with an ever changing audience of travelers throughout the Central Coast and Central Valley of California. Business never looked so good. The fun of planning a day's itinerary - from shopping and dining to rafting and zip lining - is as exciting as the adventures themselves. With the same high standards as our shows, your :30 and :60 commercial spot for your business not only "sell the goods" but encourages discovery. It's enticing. It's entertaining. And it builds business. Every day brings a new audience of travelers looking to make their vacation the very best. And with tens of thousands of viewers on a monthly basis, we have the market covered. But for all the impressive statistics and numbers, we have one measure of our success: happy customers. Some have been with us for 10 straight years, others for just a few months. This is a fact we take pride in and validates our passionate focus. Join us. Thank you for your email! We will be in touch very soon. Should you have any immediate questions, please do not hesitate to give us a call. Sign up now - we'll let you know when our latest shows are live! Please check your inbox to confirm your subscription. Thank you and we'll see you out there! !